There is an inherit association between core stability and swimming performance. However, if swimming improves core stability, how does core stability improve swimming? In swimming, the core muscles recruited are task-specific and are unique to each task. Swimming skills are specific to the exact swimming skill and even the same stroke at different speed may not be specific. 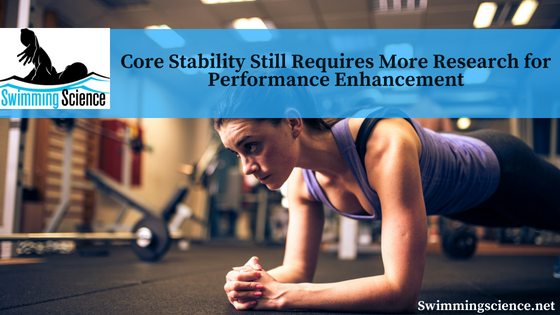 Many swimmers feel core stability will transfer to swimming. Unfortunately, the muscle recruitment sequence in swimming is far different than any core stability exercises. Another belief is motor abilities, precisely if one is capable of performing one motor task, then they are able to perform another motor task. This coordination does not transfer, commonly noted in good swimmers being poor land athletes. Some still believe core training is necessary since swimmers have “weak core” muscles. However, the core training prescribed often is at such a low level, overload is never achieved. The literature demonstrates dissimilar tasks do not improve performance and even similar tasks (resistance sprint training using a towing device) doesn’t improve the task (sprint performance). Core Training while you swim? Some attempt to brace their abdominals when they swim, unfortunately, this internal focus likely impairs performance. Instead, an external focus is ideal for performance. Swimming is a unique task and performing different activities (core stability) does not provide a unique adaptation task. Core stability training may impair performance and during swimming and internal focus likely impairs performance. Further studies on core stability and swimming are necessary. Unfortunately, the standardization of these studies is poor, making the literature to individualize. However, concrete evidence for core stability improving swimming performance is not present. Lederman, E. Core stability training: can it improve swimming performance? Journal of the International Society of Swimming Coaches. 2013 July. 3 (1): 81 – 98.